This Saturday, I will be participating in DC Craft Mafia’s UNusual Suspects Arts & Crafts Festival (immediately following my bath product workshop), which will feature over 50 vendors representing a wide array of crafts including accessories, bath and body, ceramic, children’s goods, clothing, home decor, jewelry, toys, and more. The show will be held in The Anastasi Room at the Bethesda-Chevy Chase Rescue Squad, 5020 Battery Lane, Bethesda, MD 20814. The show will run from 12pm to 6pm. The Capital Region Etsy Street Team, CREST, is holding its first group sale this week. CREST consists of members from Maryland, Virginia, and DC who all have stores on Etsy, an online marketplace for buying and selling all things handmade. CREST represents many talented artists and crafters across a wide array of mediums, including jewelry, fabric art, paper crafts and, of course, bath and body products. From Monday, October 27 through Monday, November 3, members of the CREST team are offering special deals to help jumpstart your holiday shopping. For more details, please visit the following Etsy shops and read their shop announcements. You can also do a search on etsy for the tag “etsycrestsale” to find additional items being offered. If you have any questions, please contact the individual shops. 10% off all items in my shop and a Thank you gift will be sent with each order. Attn Buyer: please mention “Crest” or “EtsyCrestSale” in “note to seller” and please wait for a revised invoice. Most items will reflect 20-50% discounts! Free pair of hair pins on orders over $25 when you write “CREST” in the notes to seller section! 10% off all week, wait for invoice. 10% off all items. Sale prices are already marked in each listing. 15% off select items. Free shipping on two or more items. In honor of my 1st year anniversary in DebbyAremDesigns (October 30th) I’ll be giving away 1 free bookmark for all orders $15 and above (one offer only per customer). 10% off total sale -not including shipping. Please leave “etsycrestsale” in note to seller and wait for a revised invoice as prices in shop do not reflect the discount. 25% off all puzzle balls and photographs in my shop. Buyer’s should wait for a revised invoice before paying. 20% off Cotton Emery Pincushions and Pincushion Rings. Sale prices are not marked. Please put “CREST” in note to seller and wait for a revised invoice. 20% off everything. Refund or wait for adjusted invoice. 10% off plus free shipping for two or more items. 15% off items in a special Sale section. In addition to a 15% discount for purchases over $20, I will throw in a set of “wine glass jewelry” for any purchase over $50.00. The wine glass tags are a set of fused-glass baubles to help your guests keep track of their wine stem at your party. Please put “CREST” in note to seller and wait for a revised invoice. 10% off all week. Revised invoices will be sent. 15% off all items. Please leave “crestsale” in note to seller. Items are not discounted, please wait for an updated invoice. 15% off all purchases for the entire week! To redeem the discount, just add your LMNOProducts purchase(s) to your cart, begin the checkout process, and choose “Other” as your payment method. In the Buyer’s Note box, mention that you would like to take advantage of the EtsyCREST Sale discount. I will then send a revised PayPal invoice reflecting the 15% discount. Type “CREST” in the message to seller section and wait for a revised invoice. 20% off all items(free shipping on purchase of more than $50)!!! Please leave note to seller on message box. Enjoy 20% off my entire collection of hand crafted sterling silver chain and gemstone jewelry. 10% off sale on everything. Purchase any variety our our organic dog treats through our Etsy shop and receive a dozen Fleas Navidad treats free. Just mention “CREST” in the “message to seller” section. 10% off all items. Prices already adjusted in the listings, so no need to wait for a revised invoice. 10% off of most items. Items will be tagged EtsycrestSale. The item prices reflect the sale prices for the duration of the sale. Sale items labeled EtsyCrest Sale. 10% off. Wait for a revised invoice. 10% any purchase and free shipping on two or more items, including custom orders. 15% off entire inventory. ATC free gift with the purchase of a photographic print. – Above the $10 level, *International customers* will be given an additional 5% off. Please wait for a revised invoice and request shipping to your location before you pay and I will revise the listing for you. – *U.S. customers* will be offered a choice of free items from my shop starting at the $10 level. – Above the $20 level my U.S. vintage buyers will be given free insurance and delivery confirmation to go with my actual shipping. Overages will be refunded. 10-15% off of most items. Items will be tagged EtsycrestSale. The item prices refelct the sale prices for the duration of the sale. Item descriptions also indicate price reduction. Ten years ago this month, I was in the midst of a very sad and strange time. One of my friends was dying of prostate cancer, another was being treated for thyroid cancer, two were undergoing chemotherapy for breast cancer, and a professor of mine had recently passed away from a brief, but brave fight against a particularly aggressive form of breast cancer. October is Breast Cancer Awareness month, so I have been thinking about these people have been on my mind lately. One aspect of my work outside of Herban Lifestyle involves staying up to date on cancer prevention research, so I read a lot about topics like diet, exercise, and other ways you can reduce your risk of cancer. And one thing you can do to keep yourself healthy is to avoid potential carcinogens in your environment, particularly in your personal care and makeup products. You may be surprised at how prevalent they are. There are many resources for finding out which ingredients are best to avoid, such as the European Union’s banned ingredients list. But one resource I have found to be very useful is Whole Foods’ quick guide to ingredients that have been found to cause a variety of health problems. Their Guide to Premium Body Care Product Ingredients is an easy-to-read list makes it simple to interpret those wordy ingredient labels. I recommend printing it out and carrying it with you when you shop for personal care products. The Campaign for Safe Cosmetics has as its mission “to protect the health of consumers and workers by requiring the health and beauty industry to phase out the use of chemicals linked to cancer, birth defects and other health problems, and replace them with safer alternatives.” Herban Lifestyle has signed the Campaign for Safe Cosmetics’ pledge “to not use chemicals that are known or strongly suspected of causing cancer, mutation or birth defects in their products.” You can find the complete list of companies that have pledged to use safe ingredients here. On Saturday, November 1st, from 11:00 – 1:00, I’ll be holding a workshop at Be You Wellness Center and Spa in Bethesda, MD. 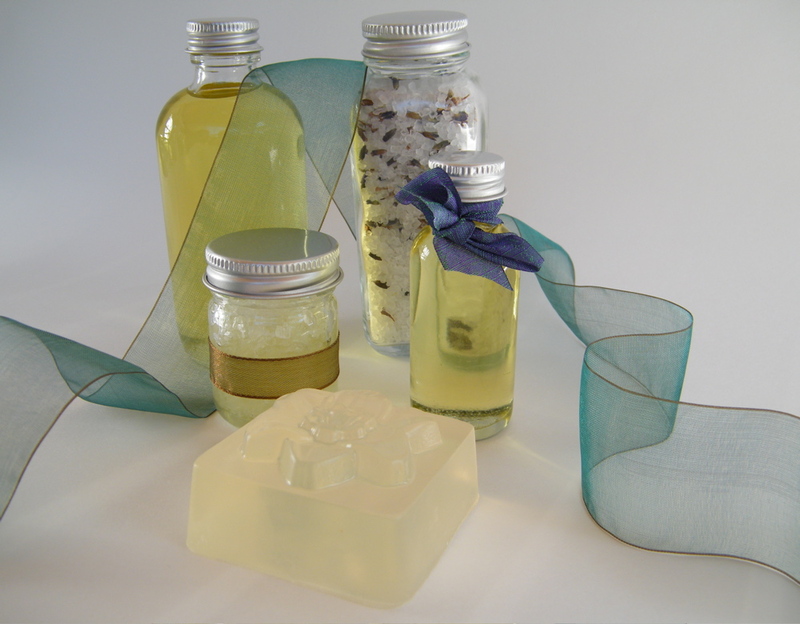 In this 2-hour hands-on workshop you will learn the basics of making natural bath and body products. We will talk about how to use various ingredients, including essential oils, and how they benefit your body. We will get our hands dirty (or clean, as it were), by making a selection of guest soaps, a jar of bath scrub and a jar of facial masque for you to take home. We will also work on packaging, making these items great gifts for friends, family or yourself! For more info, or to register, call (301) 493-4911, email info [at] beyouspa.com or visit http://www.beyouspa.com/events.html. The cost is $40 including materials. 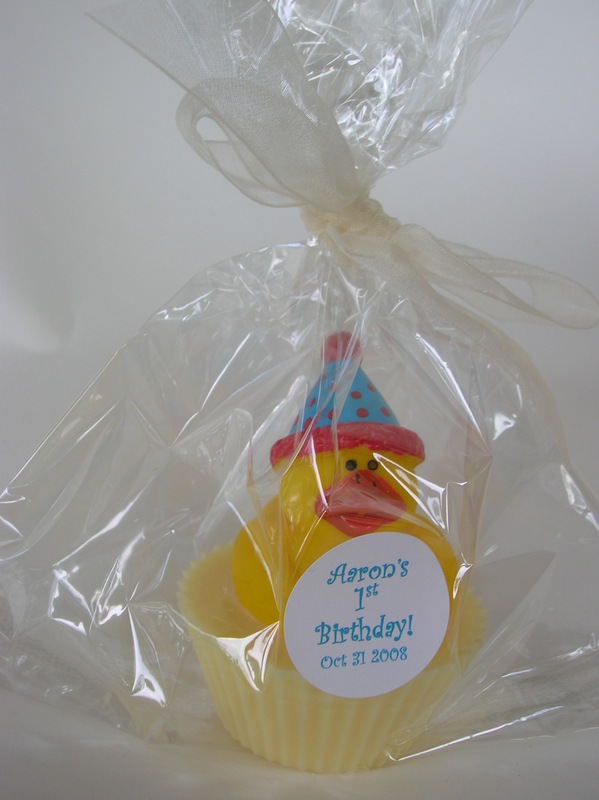 I just finished creating 50 party favors for one of my wholesale clients in celebration of her son’s 1st birthday. She wanted all-natural soaps embedded with a bath toy. So, I did some research and found this great soap base from Bramble Berry Soap Making Supplies, which has all natural ingredients, and adheres to the Whole Foods Standard for Premium Body Care. It’s a nice, opaque base made primarily from coconut oil. I then colored the soap with pure vegetable coloring that I bought at Whole Foods, and scented it with organic essential oils from Mountain Rose Herbs. I had mixed feelings about the toys, not wanting to add more plastic to the world. However, I came across these phthalate-free birthday ducks, which look adorable. I made the packaging as earth-friendly as I could, using compostable vegetable-cellulose bags, and recycled paper printer labels. My client was delighted — not only did the favors turn out to be adorable (even if I do say so myself), but they meet her criteria of being all-natural. The last couple of hairstylists I’ve visited have said that my hair is coated with minerals, most likely due to hard water — water high in calcium, magnesium and/or iron. I had noticed that my hair had been feeling very “crunchy” and kept conditioning every day in order to try and soften the feel. Both stylists said that conditioner doesn’t help, that I actually need to strip the minerals from my hair. One of them suggested a Bumble & Bumble product that is specially designed to eliminate build-up, but it can only be used once a week. I was happy to see that the product does not contain parabens, but I wanted something more natural, gentle, that I could use more often as my hair seems to be getting crunchier. It seems that these treatments can strip the hair, so it is recommended that you follow with a conditioning treatment. I found an olive oil and egg treatment that looks interesting, along with several other natural hair care ideas. In reading about high mineral content in water, I found that it can also dry out your skin, and because it makes it harder for soap to sud, leaves your laundry less clean. A commonly noted solution to this is to get a household water softening unit. I had noticed a “minerally” taste to our water, and had been considering a purifier. It seems like it’s definitely worth looking into a water softening/purifying system since it can address so many different issues. This article originally appeared in my other blog, Becoming Your StellarSelf. Wrap a handful of the dried lavender flowers in a square of light cloth, such as cheese cloth. This versatile sachet can be tucked into your pillowcase for a soothing night’s sleep, or tossed in your dryer to scent your clothing! 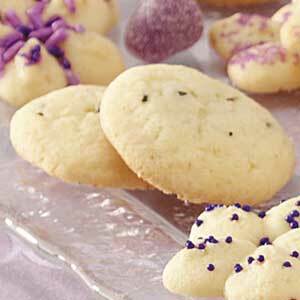 For a fun treat, add 1 tablespoon of dried culinary-grade lavender flowers to sugar cookie dough, then bake as usual. For a delicious, soothing tea, place one heaping tablespoon of lavender flowers in a tea pot, then fill with boiling water. Let steep for about ten minutes. Make lavender sugar by blending 1 cup of sugar with 2 tablespoons of culinary-grade lavender in a food processor 2 tablespoons dried lavender flowers. Store in an airtight container and enjoy in baking or beverages. You can make lavender lemonade by pouring 1 cup of boiling water over 2 tablespoons of dried lavender flowers, then steeping it for 10 minutes. Strain the flowers, and stir in 1 cup of sugar until it dissolves. 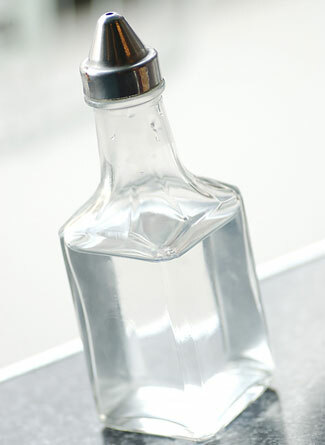 Let the lavender/sugar mixture cool, then add the juice of 6 lemons (about 1 cup), and 4 cups of cold water. Serve over ice with a sprig of lavender! If you want to make them from scratch, Taste of Home has a wonderful lavender cookie recipe, and Purple Haze Lavender Farm has some other great lavender recipes.